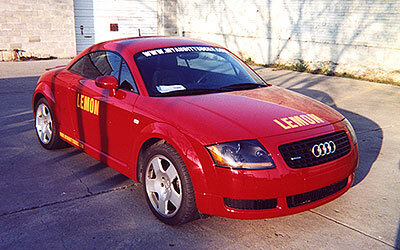 cover-up to service the Audi TT Volkswagen. right to know they could be purchasing a lemon also. ______Ok let's put this professional business to sleep. Before this phone call was recorded! Back and forth to the dealership five times. Phone caller: We fixed the problems. Back and forth to the dealership several time. Phone caller: We can't duplicate the problems and laugh in my face about it. Phone caller dealership said: I was causing the engine malfunction buy starting the car and pushing down the gas paddle. Somehow I was causing the entire Audi TT Volkswagen systems malfunction. Click here for a full rundown of service attempts. ______that I wouldn't get my car serviced. By now we know they can't fix the Audi TT problems but what can you do. Better Business Bureau Hearing. Phone caller: I'm lying about the Audi TT problems and we can't duplicate the problems. ______Audi TT Volkswagen. The dealership sales you a lemon and laugh about it. This is indeed a professional con.